History: Boring, Bunk, and Bananas...? "It's all about dead people, and nothing to do with us, and real life now, anyway!" 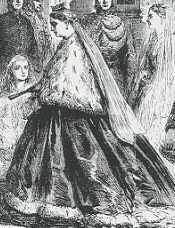 Lord Ashley, Earl of Shaftesbury. What do you mean, you don't see the connection?! This is quite a lot to read, but please do take the time to go right through it. Victorian Britain Sees Shaftesbury's Struggle against Greedy Bosses! Victorian industry workers had a hard time. Example: to stop machines in a factory, in order to clean them, means stopping them making things at the same time. This means you don't make money for a while. You send 5-year old children under the machines, to clean them while they're still going. Some will get hands chopped off by the machines, some will be killed. "Didn't their parents love them, then?" asked children in one school. Plenty of hungry people means plenty of starving parents who will send more children to the same work. There were, after all, laws against begging in the street. 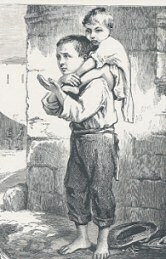 Adults and children would often work 12 to 16 hours a day, 6 days a week. If union leaders organised them to protest, they were simply all sacked, and possibly put in prison. Meanwhile Factory Bosses, who paid starvation wages, grew rich on the profits. If times were hard, they paid less... to the workers, not themselves. ... as I was saying, the young Victoria, like many other respectable people, believed that all this was Right and Proper. God had, in their view, made the different classes, rich and poor, and they should know their place. The poor, being used to living this way, didn't feel pain the same as gentle folk. It would be wrong to change things and upset everything. Which is where The Earl of Shaftesbury, a.k.a Lord Ashley comes in. Yes, he does look a bit grim, but this man worked endlessly to improve conditions for the poor, to get them more education, and less terribly long hours, and a whole lot more. And some of the big bosses really hated him for it. By the way, have you forgotten about the bananas yet? The thing was not to SEE the poor people if possible. Later, when Queen Victoria visited the industrial midlands of England, she saw more of how they lived, and was shocked, and changed her mind about Shaftesbury. If you want to find more about the argument, look at The Spartacus Website for yourself. On a page called "Child Labour simulation" there's a list of some people who were for and against the changes. SO - hypocritical, rotten Victorian England was quite happy for starving people to risk their lives and their children to make things for richer people to buy at good prices; they preferred not to know much about them. 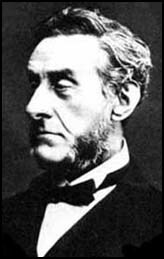 People like the Earl of Shaftesbury made many people angry by stirring things up. What a good thing there were people like him, who cared enough to change things. Yeah, yeah, that's all long ago. We don't live like that now. OK, it was bad for them, good for the Earl. Whatever, it's all sorted now. Why should we need to know all that stuff? It doesn't happen now. And why the bananas?? Read on. Here's some modern history. It's happening now - you're part of it. Do you have the power to be Shaftesbury or the factory Boss? Nowadays, most people in Britain, Europe and the USA buy bananas. They're cheap. They're a good snack. They are among supermarkets' biggest money earners. Good news for Banana farmers, then. Around the middle of the 20th Century, Britain persuaded the Windward Islands, in the West Indies, that it would be good to grow bananas. Britain needed bananas: "You grow them, we buy them, you've got good business." So they worked really hard on building up the banana business, rather than other things. Soon Bananas became their main business - pretty much their only business. They depend on them. But they're OK, because Britain told them they'd always be buying from them, so that was good. So no worries. To improve profits, most supermarkets only want to buy regular sized, perfect yellow bananas. They don't like waste. So they encourage farmers to use pesticide sprays. Then the supermarkets compete to keep the prices low for us, the buyers. They cut the price of the bananas. To protect their profits, they simply pay the farmers less. OK, so this starts to sound a bit like the Victorian factory bosses, but where's the danger to lives, and all that? In South America - Costa Rica, for example, and Cameroon in Africa, big plantations are being cut into the forest. This means the area is more likely to get damaged by floods. They grow bananas more cheaply than ever. Pest-killing sprays, lots of them, keep the fruit pest free. It would take time to get the workers out of the way first, so they simply have to stay and get sprayed too. People are getting ill, and some babies are being born without hands or feet. Where union workers try to change things, they get imprisoned. One has been inside 22 times so far. But, hey, these guys live the other side of the world. That's their problem. We get cheaper bananas, so that's good for us. 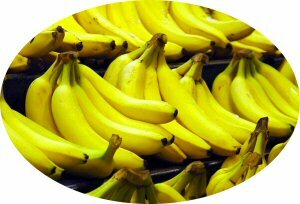 Many supermarkets in Britain, Europe and the USA like these bananas best because they are so cheap. They arrive ripening in plastic bags, which are treated inside with pesticide, and filled with gas to help the fruit ripen. The pesticide is likely still to be on when you eat the banana. It's known to be poisonous to humans. creatures in the rivers were dying. People were getting less healthy. Their profits were getting less and less. A new way of selling called FairTrade began to make a difference to them. They stopped using the chemicals, began charging more for the bananas, and used the extra money to build schools, and so on. The only trouble is, since the bananas cost more, people here in the West have to decide to spend more on the fruit on purpose to help the growers. Their fruit is not ripened in gas filled bags. There is no pesticide used. How can you tell which ones they sell? They have the Fair Trade mark on the bag. They cost more to buy here, but they don't cost the growers their lives. Or you can just decide that you prefer to get your bananas cheap, and not worry about the people producing them. You'll probably never meet them. The World Trade Organisation, led by big European and American companies, prefers to allow competition to drive the price paid to the growers lower and lower. The companies, who are the same ones running the plantations in Cameroon and South America, argue that protecting Fair Trade growers stops them, the bigger companies, from getting a fair crack at the profits...by which they mean ALL the profits! If they succeed, the people on the Windward Isles will have no way of making money, and all the bananas you buy will be produced using methods which Victorian factory owners would be proud of. I first wrote this a few years ago when I found out about it. In October 2009 there's more news. Supermarkets in the UK, led by Asda, which is the American Walmart chain, are having a "price war" on bananas to see who can sell them cheapest. Great - you get cheaper bananas than ever! Not so great... if they keep it up for long enough the banana growers will first get poorer and poorer, and in the end, they'll stop growing bananas. They won't be able to afford to grow them. And there was the great British Victorian Public, buying things produced by unscrupulous factory owners because they were cheap, and they preferred not to ask too many questions. So who are you? The modern equivalent of the Victorian British Public, or the Earl of Shaftesbury and his supporters? - Because what you buy really does affect what the supermarkets sell. Here's the FairTrade organisation site. This page refers to Lord Ashley, the Earl of Shaftesbury, reform of Victorian working conditions,children in factories, fair trade,bananas,World Trade Organisation,supermarkets,Asda,Walmart,Oxfam,Richard York,historical teaching in schools and museums, Victorian history.